I have always enjoyed reading Heinlein's books, but it is his dialogue that holds my attention the most. His characters play with words and by doing so demonstrate relationships and conditions. 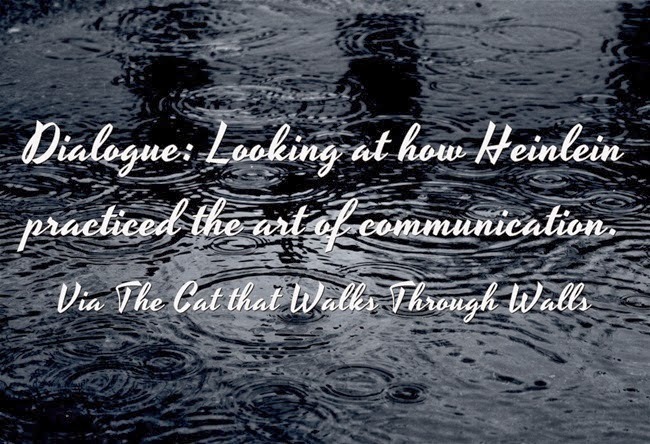 This excerpt from The Cat that Walks Through Walls is a great example of how his dialogue clearly separated and defined his characters. Gwen and Richard have just crash landed on the moon and are hanging upside down still strapped into their seats. It has been a rather eventful landing, the end of which finished with the space vehicle twirling in a wobble on its rocket end until it lost momentum and fell over. Not once does Heinlein use a tag other than the initial first person reference to the conversation continuing after the landing, yet it is obvious who is speaking. I added, "That was a beautiful landing, Gwen. PanAm never set a ship down more gently." Gwen pushed aside her kimono skirt, looked out. "Not all that good. I simply ran out of fuel." "Don't be modest. I especially liked that gavotte that laid the car down flat. Convenient, since we don't have a landing-field ladder here. "Richard, what made it do that?" "I hesitate to guess. It may have had something to do the processing gyro...which may have tumbled. No data, no opinion. Dear, you look charming in that pose. Tristam Shandy was right; a woman looks best with her skirts flung over her head." "I don't think Tristam Shandy ever said that." "Then he should have. You have lovely legs, dear one." "Thank you, I think. Now will you kindly get me out of this mess? My kimono is tangled in the belt and I can't unfasten it." "Do you mind if I get a picture first?" The dialogue supplies all sorts of details. Not only are they upside down, but Gwen's outfit has left her revealing her legs and the borrowed kimona is doing more than just causing a little embarrassment. Her view is obstructed, she cannot extract herself from her upside down position and it has provided more about her personality and relationship with her newly acquired husband. She is handling the situation calmly and able to banter back and forth. Richard's response to the whole thing is humorous, playful and providing them both with a way to vent off the frustration they are feeling. Remember they are somewhere on the moon currently upside down in a craft that has not been functioning properly. The deck has been stacked against them, yet they behave as if being together is their ace in the hole. How does this affect the reader? The reader can't help but fall in with them. They are going to get out of this situation, somehow, and it is going to continue to be humorous even when things get worse. Another feature of this dialogue is the word choice. Richard describes Gwen's appearance as "charming." Clearly he appreciates the view, but he also appreciates the lady he is viewing and repeatedly uses endearments that support that he would view the whole impression as "charming." The allusion to Tristam Shandy lends spice as well; it is a compliment Gwen takes with a grain of salt. "Thank you, I think." Heinlein creates distinct characters, though he has been accused of using the same characters over and over again. It is more, in my opinion, that he uses the same character type for his main characters: strong, resourceful, nonsensical with a purpose. But they are not the same character; if they were, the above dialogue would lose its anchor. There are several cues which assist the reader in tracking who is speaking, but they smooth the reader along. Richard discusses the appeal of a woman with her skirts over her head, Heinlein describes her reaction to Richard's statement about her landing the craft, and Gwen calls him by name and demands he help her with her belt that she believes is caught in her kimono. All these help the reader maneuver through the dialogue. It is a fun piece of dialogue that lets the reader know the conditions and the characters' response to it and each other with ease and without a lot of description or overloaded dialogue.